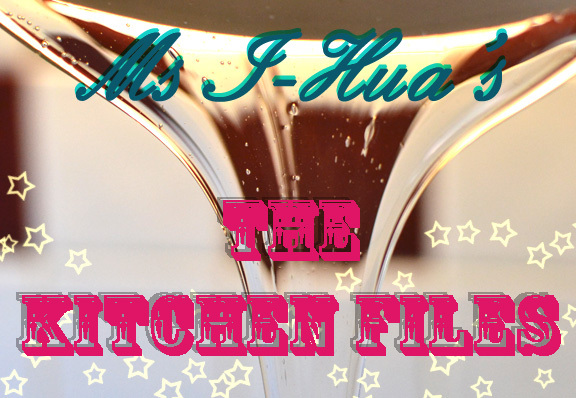 Previously on The Kitchen Files, we encountered something fishy and also a chicken crossing the road successfully showcasing some of the wins and losses the Boy and I incur in our humble kitchen. After rice, noodles are a big part of the Asian (mostly Chinese) diet. We are so well known for it that the great Marco Polo took some noodle samples back to Italy and created spaghetti (or legends would have us believe!). To be perfectly honest with you, I’m quite happy to not eat rice on a daily basis, but noodles is something else altogether. It’s my life-line (see what I did there?)! I have to eat noodles, if not once a day, at least three times a week. I don’t care which cuisine I’m having the noodles in, it can be Italian, Malaysian, Chinese, Vietnamese or Japanese, but I have to have my noodles. This as you can see, has made life quite difficult for me on my no-carb Paleo (or rather Faileo) diet as I succumb to noodles each and every single time. Luckily for me, the Boy is just as happy to eat noodles or rice, so it’s a win-win situation for me! So I invite you, dear friends (are we not?) to join me on my love with noodles with some of the home-cooking we do at home. Remember, this is part of our kitchen files collection, thus no proper measurements or recipes are listed (as we go with the flow and just cook without tasting). They are easy, fail safe, and most importantly amazingly perfect as the cold winter beckons! Prepare the char siew with this recipe. Noodles can be found in most Asian groceries, either fresh (in the chilled section) or dried (using Myojo’s Mee Poh Dry Instant Noodle). I like to serve my noodles with 2 teaspoons of dark (thick) soy sauce and 2 teaspoons of garlic oil. To prepare the garlic oil, simply dice finely a few cloves of garlic (the more you use the more intense the oil will be), heat up about 5 tablespoons of oil (preferably vegetable) in a saucepan and fry the garlic until it turns brown. Alternatively you can heat it up in the microwave, I do this when I’m too lazy to find a pot. I also heat it up in short bursts of 30-40 seconds as I don’t want the garlic to burn. 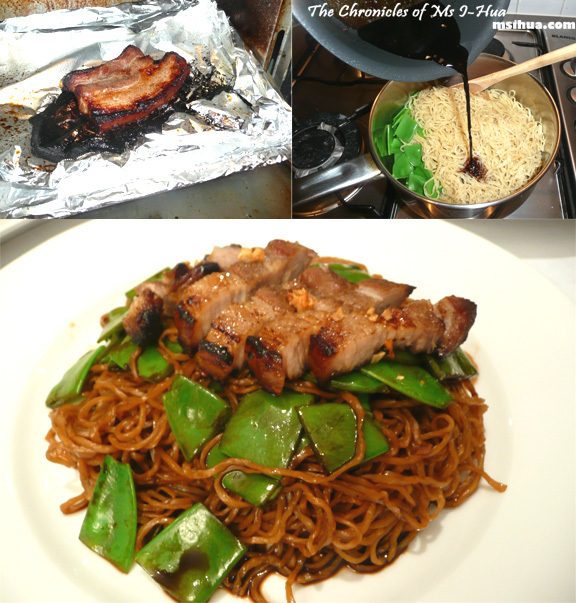 We have also cooked up some pork belly in my trusty ovenette, tossed some wantan noodles (egg noodles) to serve once again with some dark soy sauce, garlic oil and voilà! The pork belly was marinated with Chinese five spice powder (from Penang, Malaysia), soy sauce, fish sauce, a dash of white pepper and a teaspoon of brown sugar. Cook in the ovenette for around 15 minutes, set aside to rest and when you’re ready to serve, slice them up in to chunks and you’re ready to wok and roll baby! Another of our favourites is the Dried Yee Mee or Dehydrated Egg Noodles, which can be found in most Asian groceries and it usually comes in a long packet with 4 pieces. To cook, simply fry the noodles (in its dry state) in hot oil for only a few seconds as they burn quickly. Set aside on kitchen towel to drain oil. Prepare the egg chiffon sauce by frying the garlic until fragrant, then adding the pork, followed by chicken stock, oyster sauce and soy sauce. Once the stock starts to boil, add Asian greens and simmer for a minute or two. Add your thickener (mixture of cornflour and water) and mix into the gravy, continue to simmer for a minute. Turn to high heat and add beansprouts and mix the gravy for 1 minute before turning off the heat. Add egg in and stir into the gravy. The residual heat should be enough to “cook” the egg. When you are ready to serve, pour gravy over noodles (don’t do it too far ahead or else the noodles will become soggy!). Sometimes, we also use the basic Chow Mein noodle packets which you can find in all supermarkets, usually located in the refrigerated aisle alongside tofu and cheese. The Boy likes to cook chow mein with this simple recipe. Start by frying your ingredients base with garlic and pork. Add some chicken stock, oyster sauce and soy sauce to create the base sauce/gravy. Add in fish ball, Asian greens (or any other vegetable) and noodles, and stir fry all ingredients together. Add more chicken stock if it gets too dry. Finish off by making a well in the middle of the wok (push ingredients to the side) and crack in an egg. Once the egg is half cooked, push all ingredients back to the middle and mix everything together. Sprinkle a dash of grounded white pepper and plate up. So tell me friends, which noodles would you start experimenting with? Aah… I used to be the opposite, I cannot live without rice! But these dishes you’ve whipped up at home are just so comforting, they look delicious! Hahahaha… I used to be as well, but as I am getting into old age I find I cannot live without noodles! What no soup noodles? I also adore rice noodles, be they mai fen (rice vermicelli) or ho fun (flat rice noodles) in soup or fried. And as you can probably tell, I love noodles! Hahaha good point! I’m not very good with soup noodles at home but I have a bowl or ramen, pho or laksa once a week! 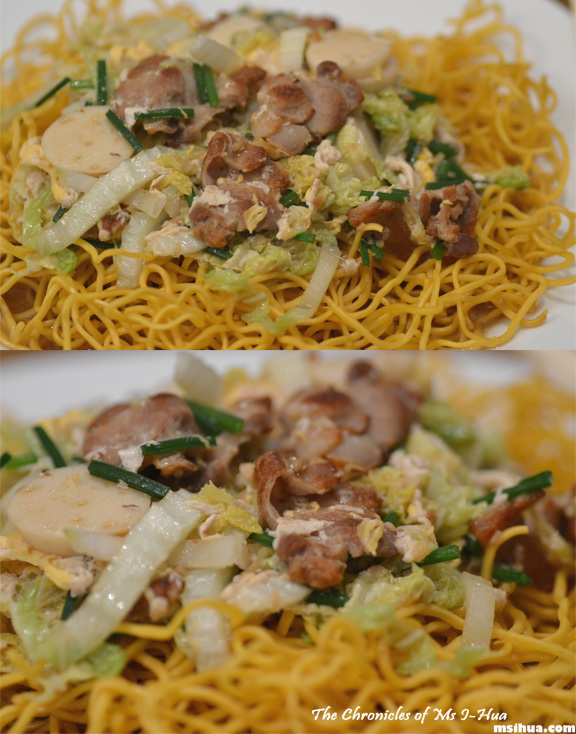 Have serious craving for yee mee now. Growing up I never got to eat it very often because my parents said it was unhealthy. I should make it soon! Ooops! Sorry!!! You should make it soon! And have it in a claypot with a poached egg!!! If you are trying to go low-carb, maybe kelp noodles? I haven’t had them, only heard of them as a very low-carb noodle, don’t know if you can get them where you are. Kelp Noodles? OMG.. I love the sound of that! Must go hunt them down! 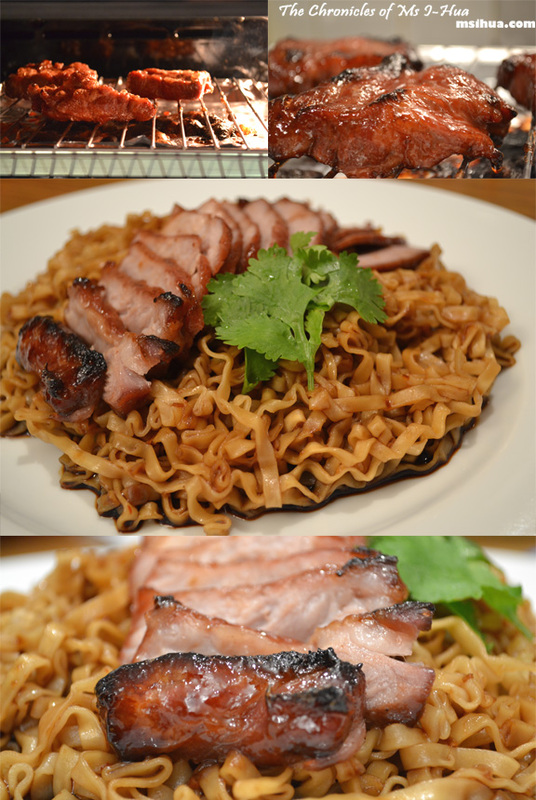 That BBQed pork with noodles looks amazing – love it! Aww thanks Cara! It tastes even better! Damn it I-Hua, I want noodles with BBQ pork now…. NOW damn it!! OOOOPPPPPSSSSSIIIEEEEE Everyone wants char siu.. I think I’ve hit the mark for the perfect Winter dish! Oodles of it! Thank you! I’m a sucker for good noodles too… so hard to resist! 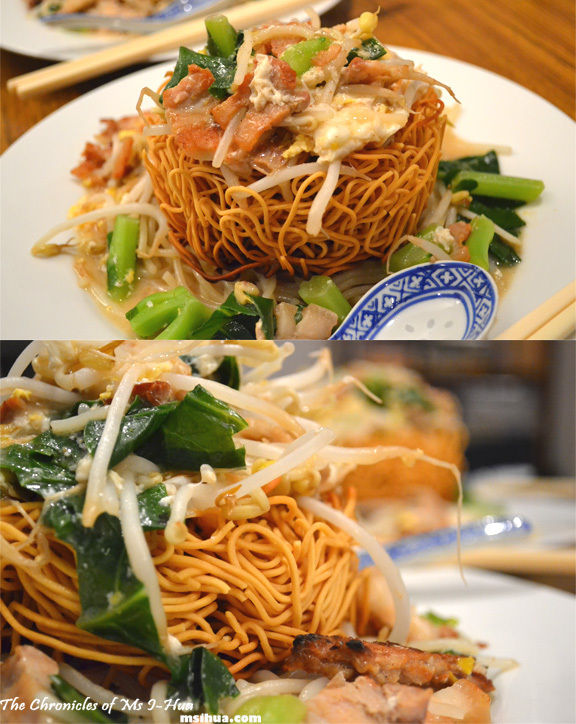 The char siew with the mee pok looks delicious. Lucky I’m just looking at it on the monitor! Well, actually not so lucky cos I wouldn’t mind some right now! I know right.. we should go early one day to purple peanuts for some noodles! oh god, hua….v was right…i do want char siew now! I shall try again!! Lol.. told you to make it.. and you can use the easier recipe instead 🙂 It’ll be good! Oh my god YUM! I’d order this in a restaurant 🙂 it looks delicious! I used to not really like noodles but am starting to like it. Lots of great ideas you’ve presented to make my noodles even better. Really? How can you not like noodles? WHO ARE YOU! ?